You have seen industry trends on the use of mobile devices and how S&P 500 companies have upgraded their websites to support mobile users, but what about online investors specifically? Should you continue to post a PDF of your Annual Report and Proxy Statement? Or do online investors want more than PDF? EZOnlineDocuments has conducted research and gathered data from our own clients’ hosted documents to show trends in how investors view online documents. Below are statistics and analysis from that research. These statistics show what investors are looking for in an online document and how investors are viewing an online document. 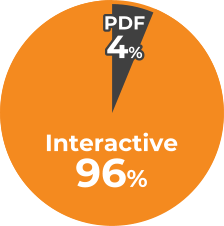 The results of our findings are clear: investors overwhelmingly pick the Interactive version of a document over the PDF version 96% of the time. We’ve also seen from 2016 to 2017 an uptick in the total number of investors using mobile devices to view an online document (now 13%). Lastly, our MEET the BOARD™ feature, which utilizes the best of what Interactive documents have to offer, has skyrocketed to the most viewed content page in our hosted online Proxy Statements. Investors want more than PDF! Contact us today for a free quote. Moving past PDF is important and cost-effective.